buildscharacter: Really? Because you know you have a southern neighbor too right? buildscharacter: And if not yes then it's in his cap circle. Dawkish: is that across the bridge? I note the "too", meaning someone (likely buildscharacter) has been telling people my location. And the info about "in his cap circle" is misinformation, although it's probably builds's assumption rather than a lie. 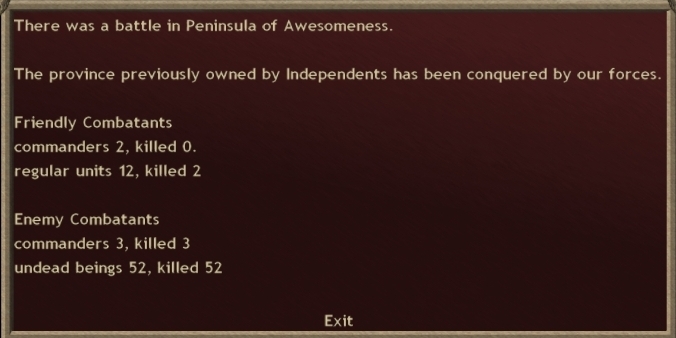 Either way, Dawkish didn't seem willing to give me a province on his side of the bridge. Dawkish is a veteran player, but doesn't pay much attention to detail. I expect he knows a fair amount about battlemagic, research paths, thugs and SCs, but doesn't pay much attention to round-by-round scripting, placement, or movement traps. Sauromatia, who worship President Skroob, played by Dawkish, has claimed the other side of the bridge. So that's it. 6 provinces, with chokepoints as borders. Out of provinces to expand to on turn 6. This is a map that's supposed to average 14.7 land provinces per player. buildscharacter: Yeah, your position on this map is really really bad. buildscharacter: Like it's silly how bad it is. Don't worry, I'll deal with it. So, this turn's battle. I went in banish-scripted to a province filled with undead. Truth be told I don't remember what message I sent in reply to TC, if any. I don't have one on file for this turn, but I could have composed it after I backed up my orders. 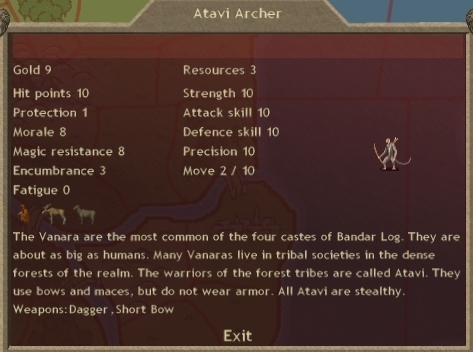 Atavi Archers are a backbone of the monkey nations. Simple, cheap, spammable short bows. Their one trick is that they're stealth-capable, so you can surprise someone with extra archers if you want to. But here I'm making them because I need volume of fire against his unshielded sacreds. A lot of players underestimate short bows; the protection / damage / critical hit formulas are highly in favor making small hits bigger, so short bows can be devastating even to armored targets. And one shot a round will also trigger morale checks frequently, as opposed to, say, cross bows with one shot every two rounds. 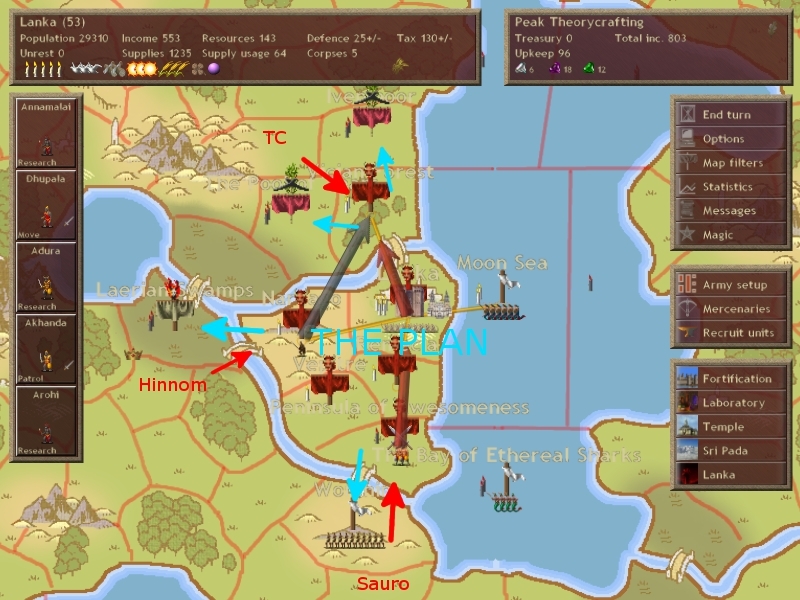 I've also placed what I hope to be a winning bid on the Farstrikers, a company of 30 Longbowmen. 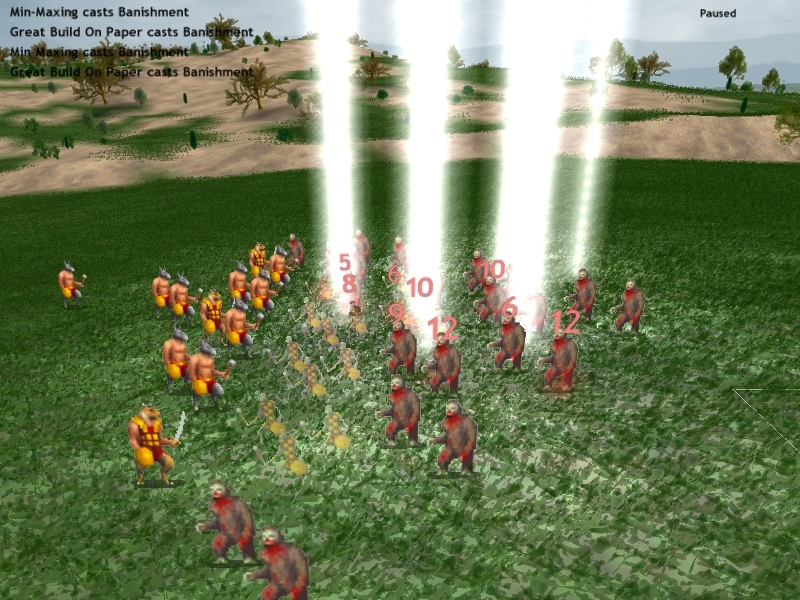 Longbowmen shoot once a round, but at higher range, better precision, and more damage than short bows. The Farstrikers are perhaps my 3rd favorite merc company; only The Ship Wreckers or the Skull Smashers exceed them. 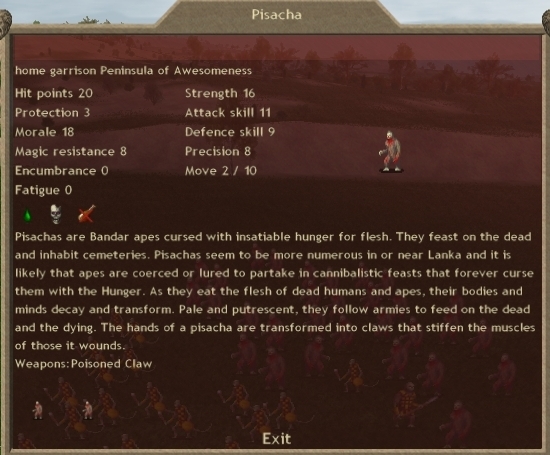 Dhupala heads north with 18 demons, hopefully to be joined by 30 Longbowmen mercs. 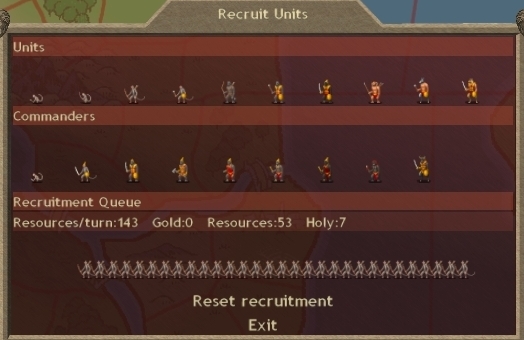 This trick isn't worth much in the short term, but never forget that indep provinces have recruits. 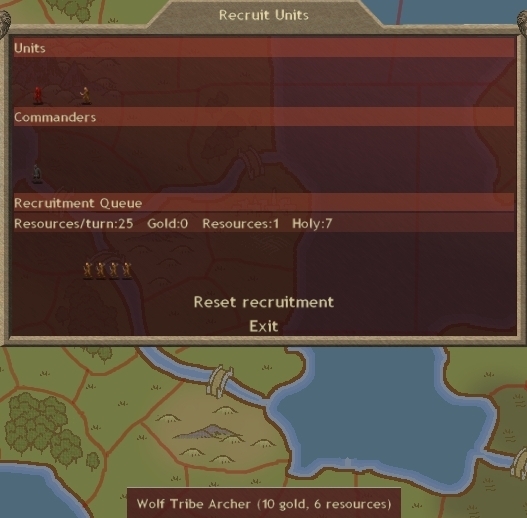 Here I'm recruiting 4 archers in the province I'm moving to. 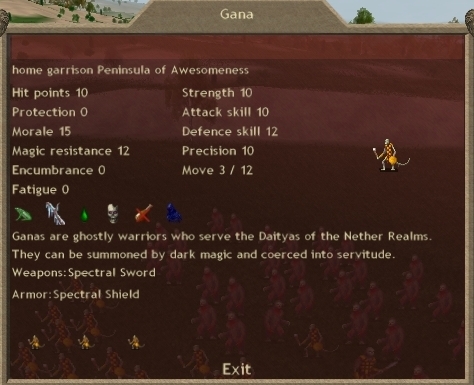 Next turn: The 10 demons I have down south, my prophet, and the 30 archers I'm recruiting this turn head north.